Hoping you will have a most glorious May. When I was young and in Elementary school we always made a May Basket to take home. We were told to secretly hang it on someone's door and run away, so it would be a secret. Some of us hung it on a secret admirer's door or on our own home. 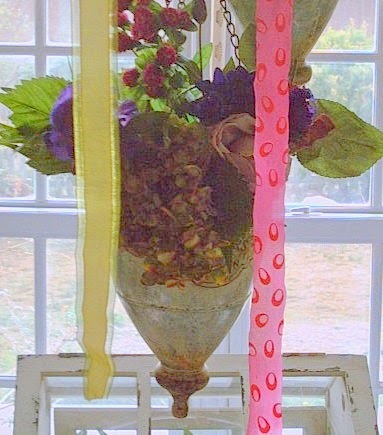 My tablescape today is full of flowers. Some Tussie Mussie's. 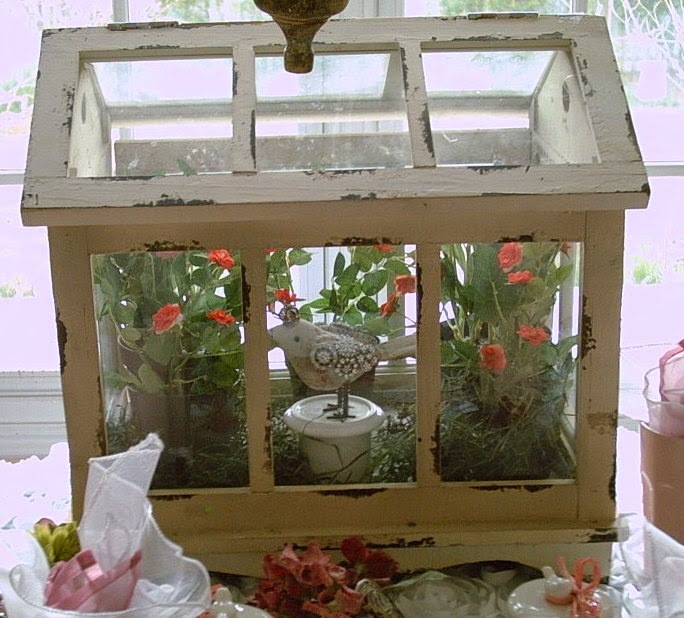 A terrarium with flowers and an adorable jeweled bird and some floral & bird plates. 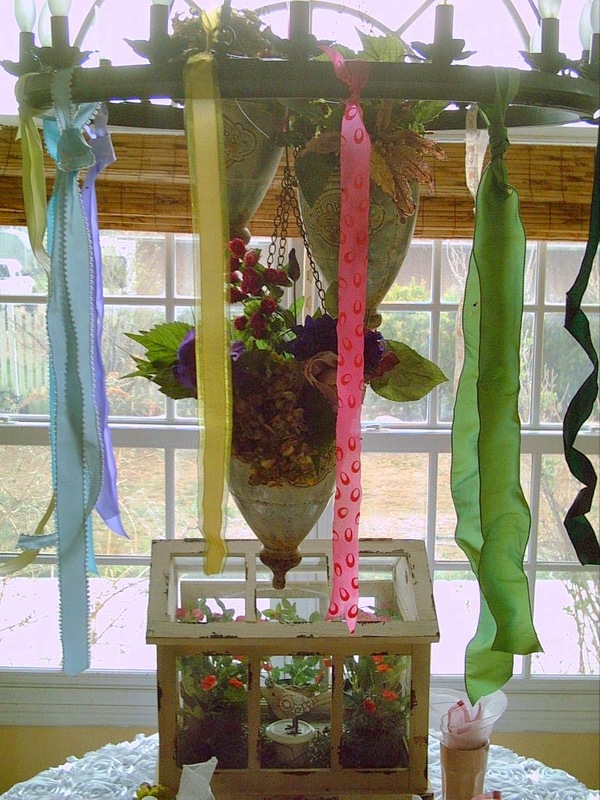 The ribbons hanging from the chandelier make me think of May Pole ribbons. My bird done in fabric French script. Loaded with rhinestone bling and a bling crown. I found this at my favorite Drug store's summer sidewalk sale. 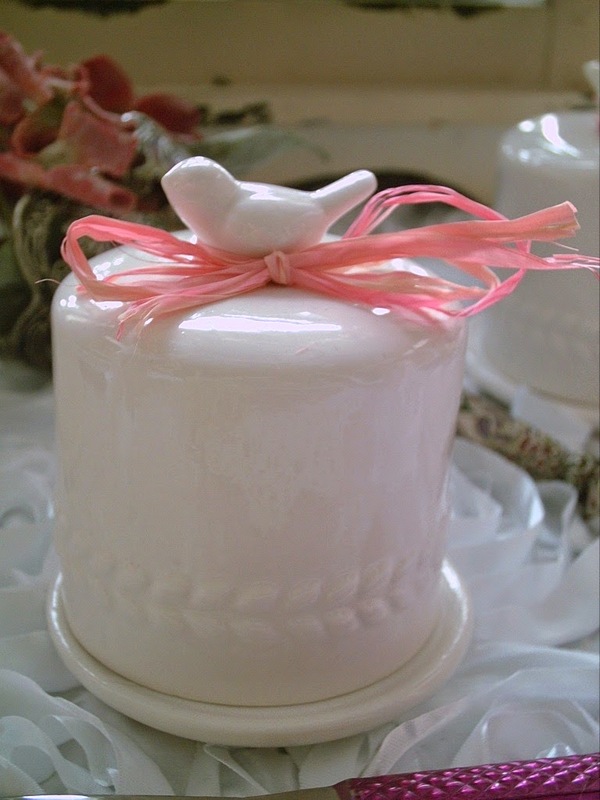 My cute little individual bird butter keepers. 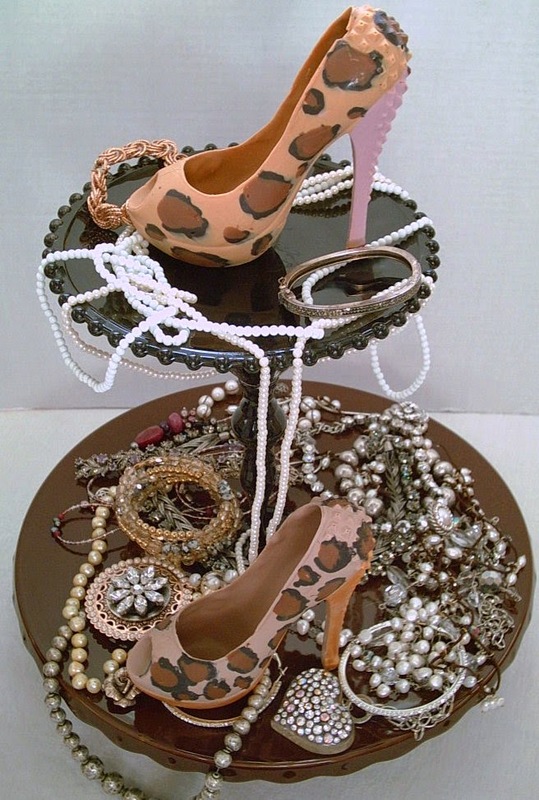 I collect Tussie Mussie holders. 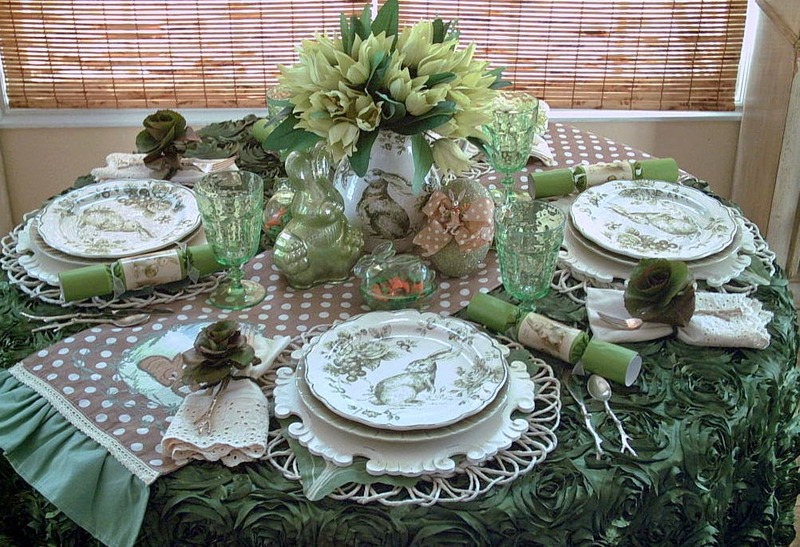 I have used 4 different styles for this tablescape. 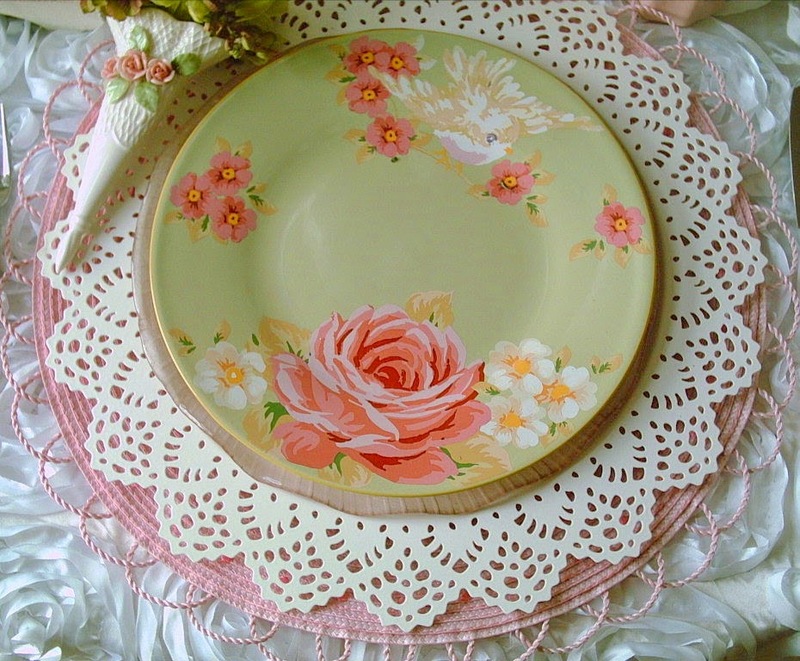 I will be posting this tablescape on Between Naps on the Porch for Tablescape Thursday. 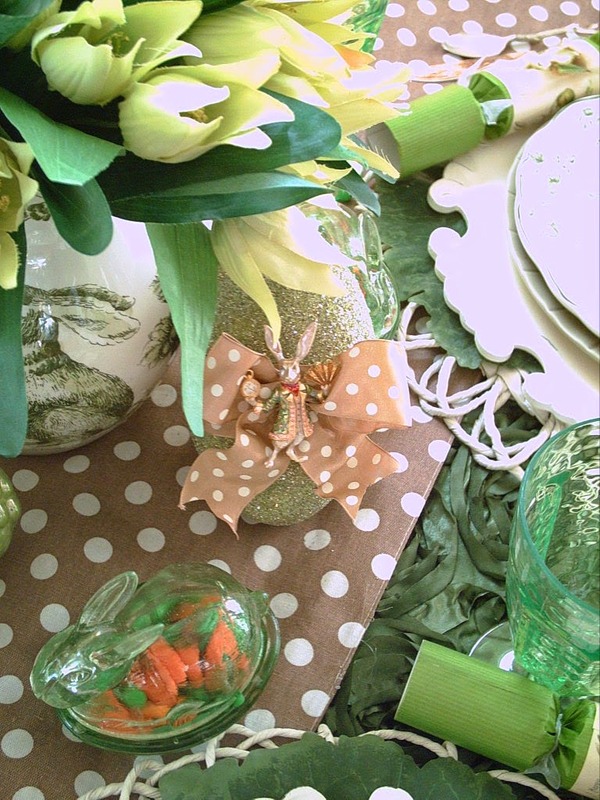 My Daffodil Bunny Tablescape. Loaded with lilacs. 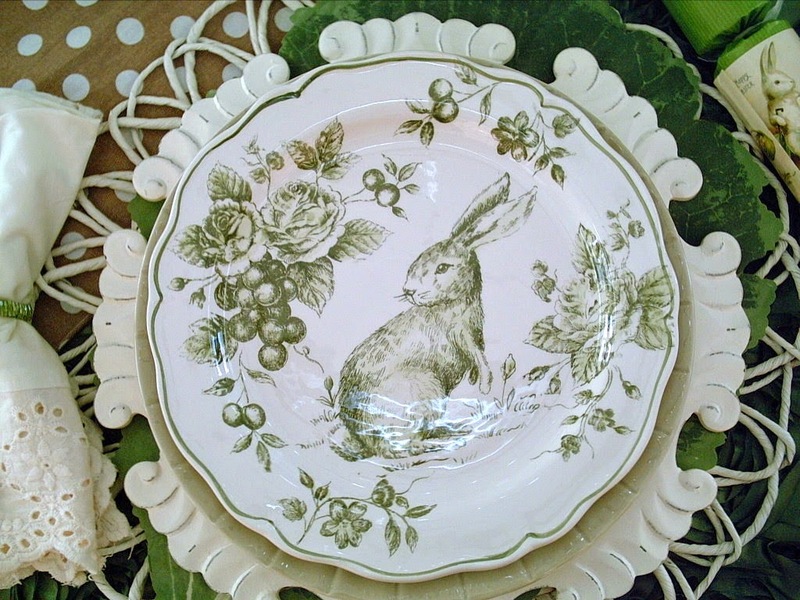 Inspired by my little lavender, white, and yellow Bunny salad plates. And my prolific lilac blooms. 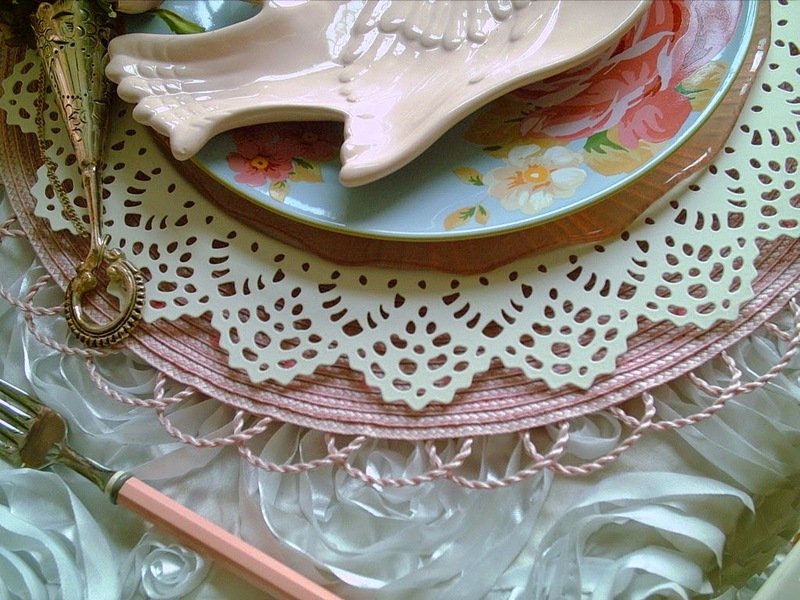 Everything used on this tablescape are items I have had for quite some time. I bought nothing new except the lavender truffles. 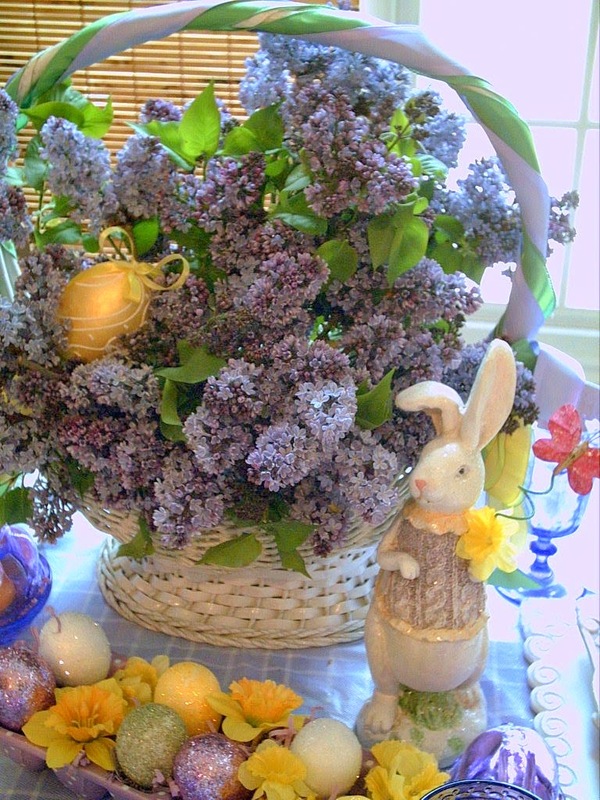 My centerpiece is a wonderful fragrant basket of Lilac's. The heady fragrance is intoxicating in my breakfast nook.. 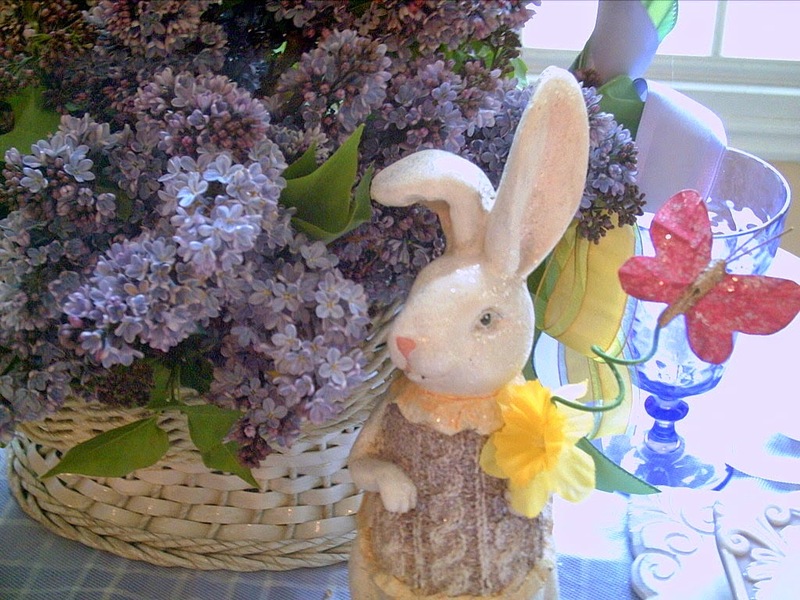 I have over a dozen varieties of lilac bushes in my yard. I have always loved them. They remind me of my parent's and grandparent's. Growing very well here as the soil is very alkaline. BUT today it is snowing and as we live on the foothill's of a mountain, Flora blooms 2-4 weeks later than just a mile or two away. It was hard to find lilacs blooming in my yard. One bush did not fail me, it was in almost full bloom. 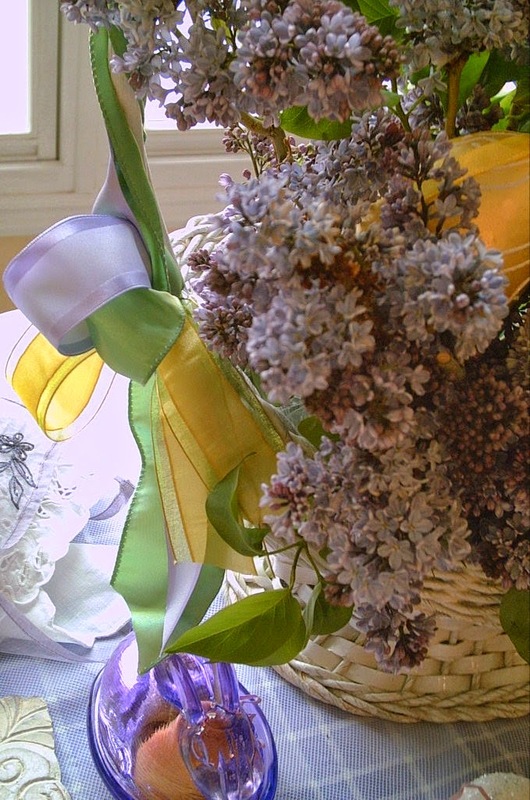 My basket is vintage from an antique store outside of Portland, OR..
You know what, I think my basket of lilacs looks like a drawing or picture on a vintage Easter card. 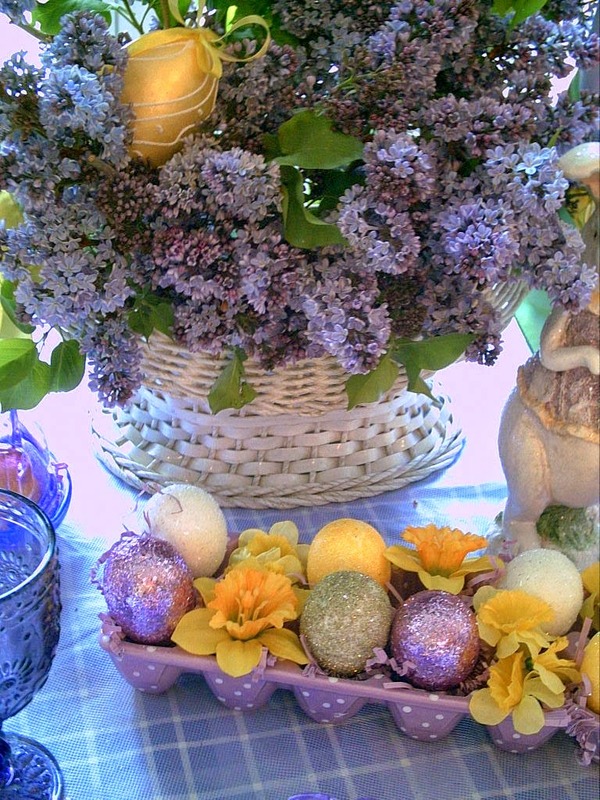 I like to use a lot of colorful egg crates in my spring tablescape's. 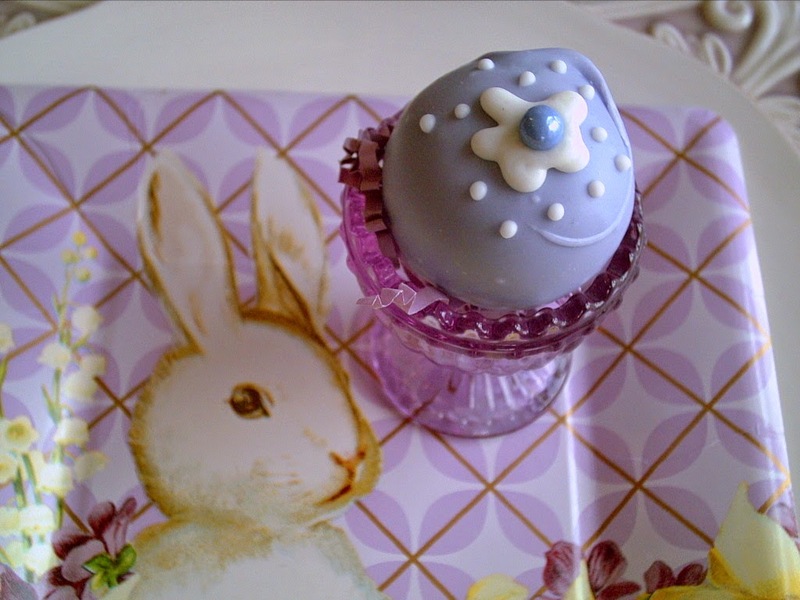 I really like the lavender and white polka dot one pictured here. 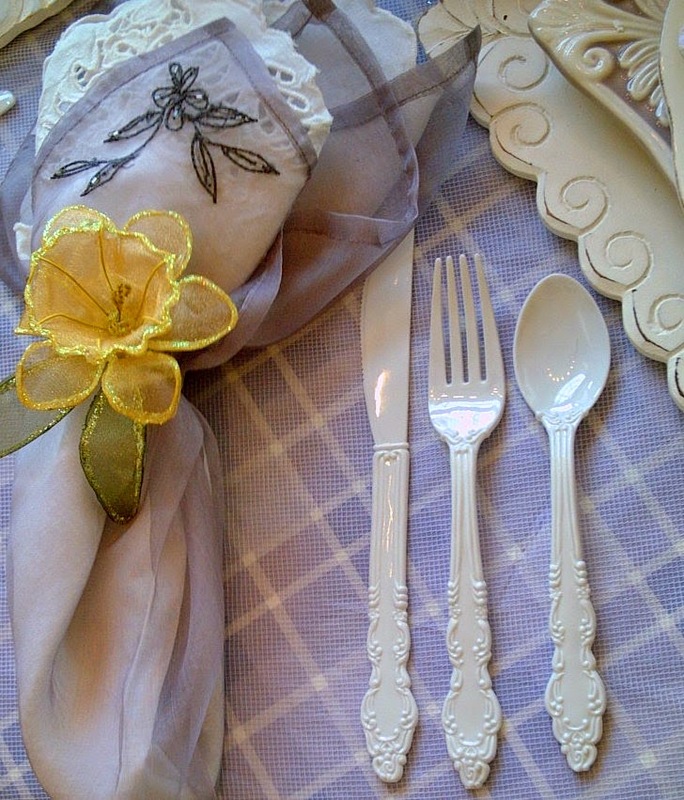 I love the white plastic flatware. 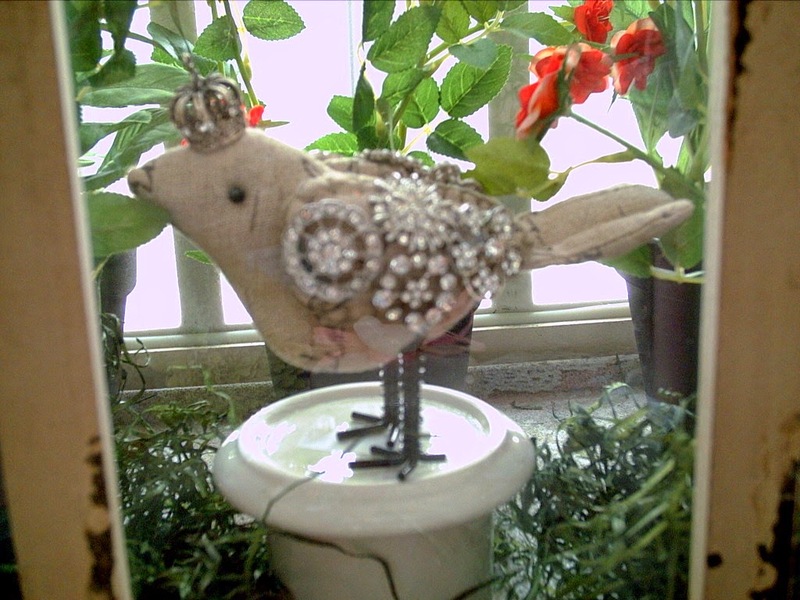 It is so ornate and unique. 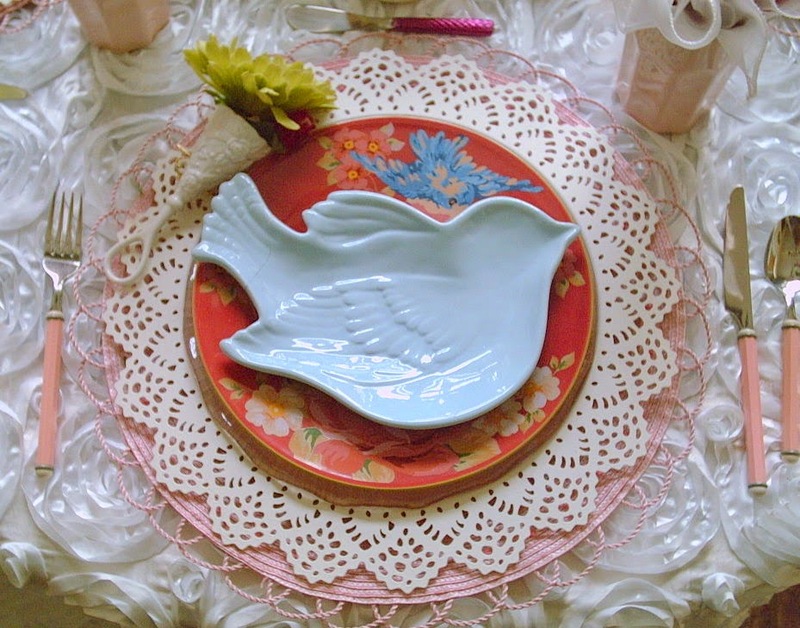 Not your usual style of plastic ware. I originally found them in Newport, R.I.. I now have more, in other fresh spring colors. 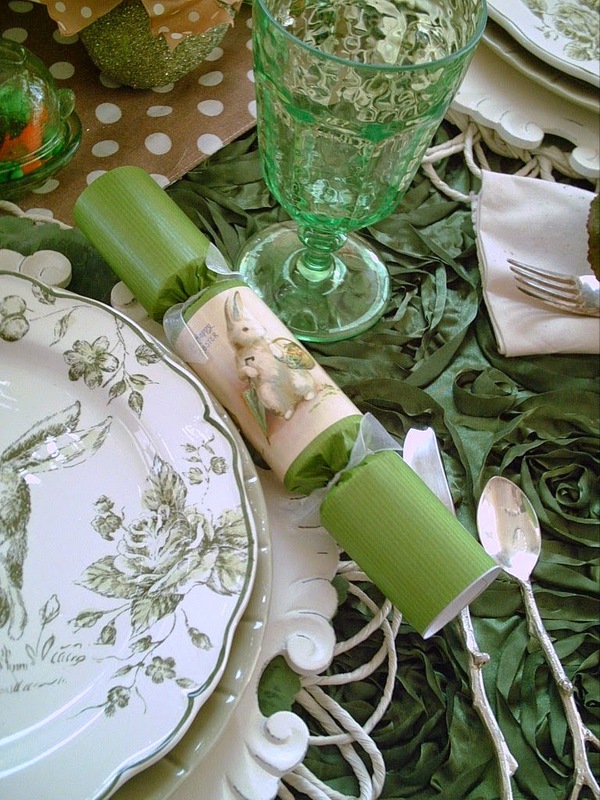 The daffodil napkin rings are from Katherine's Collection. Purchased a long time ago. 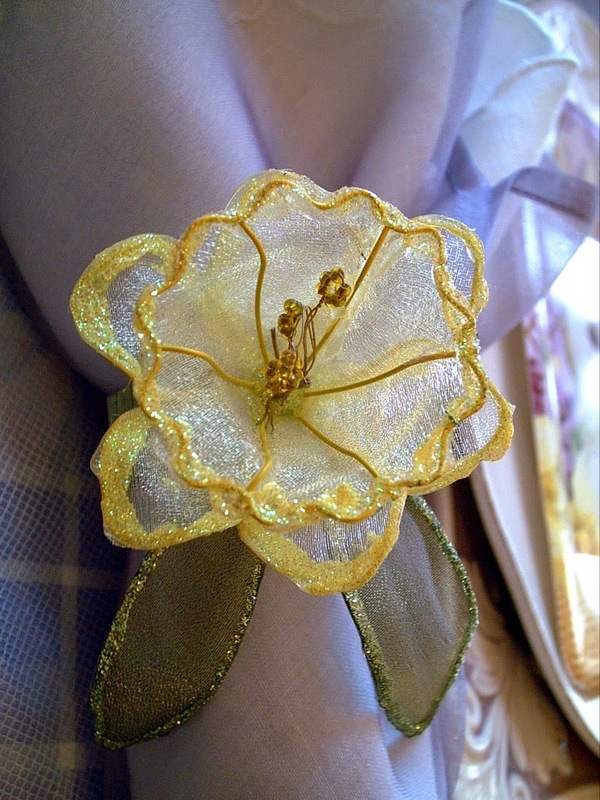 Love the glitter and gossamer fabric! My only purchase this year was the lavender chocolate truffles. This is an alternate centerpiece. 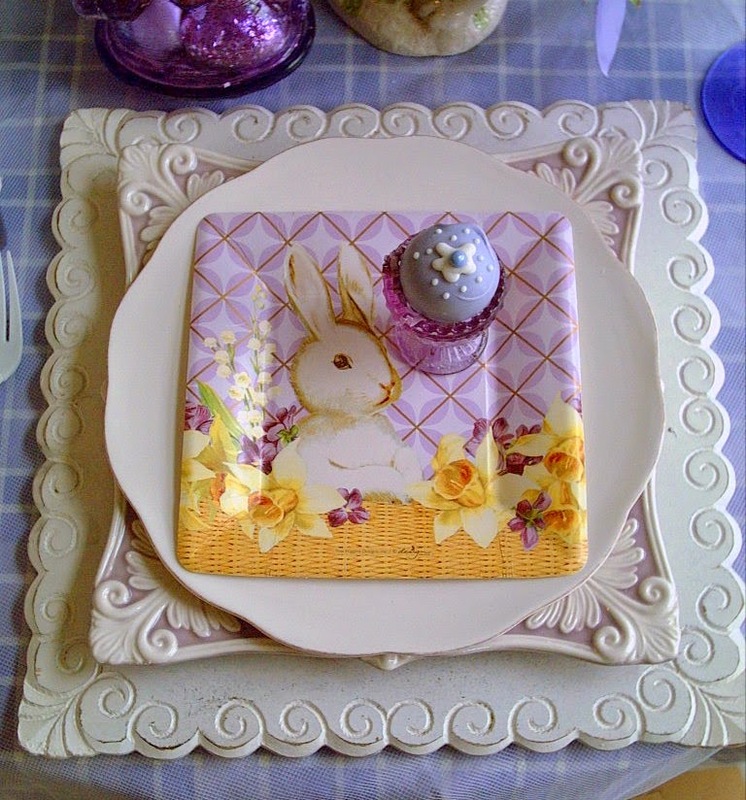 I am using an Easter/Spring cake plate, showcasing the truffles and some candy eggs. 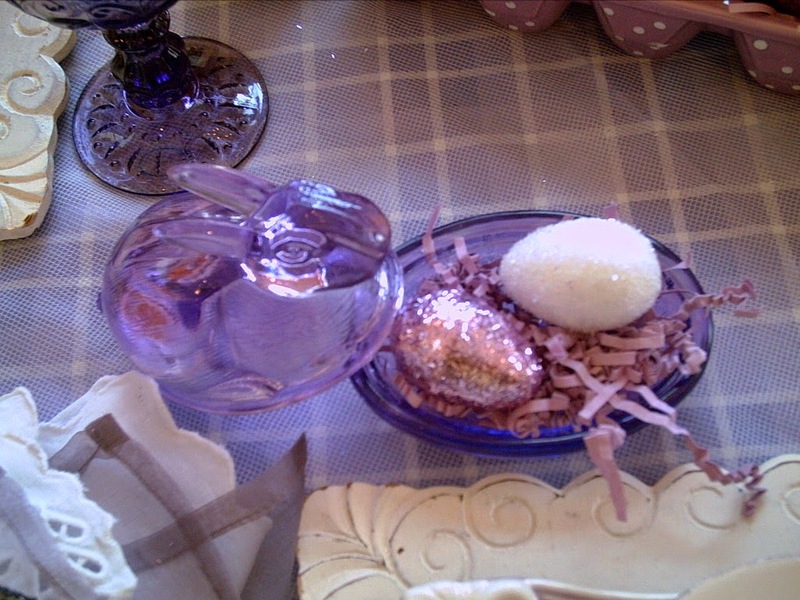 The eggs came from a little French boutique called Maison de Confisserie. They sell beautiful candy and gifts. 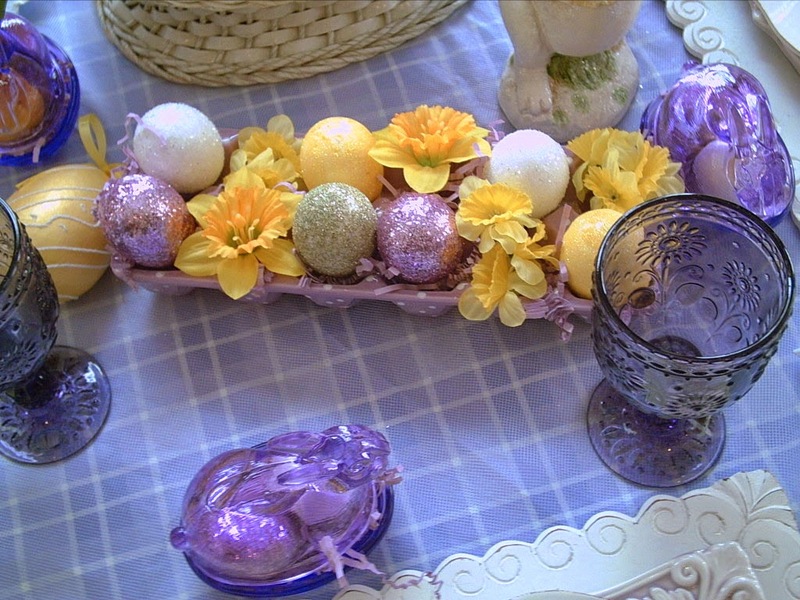 The eggs are to look like Robin's eggs, quail eggs, and I can't remember what I was told the other blue eggs were. The flavors in them are unique. One is a butterscotch with 2 layers of chocolate with a candy coating. The tan speckled quail eggs are salted caramel. 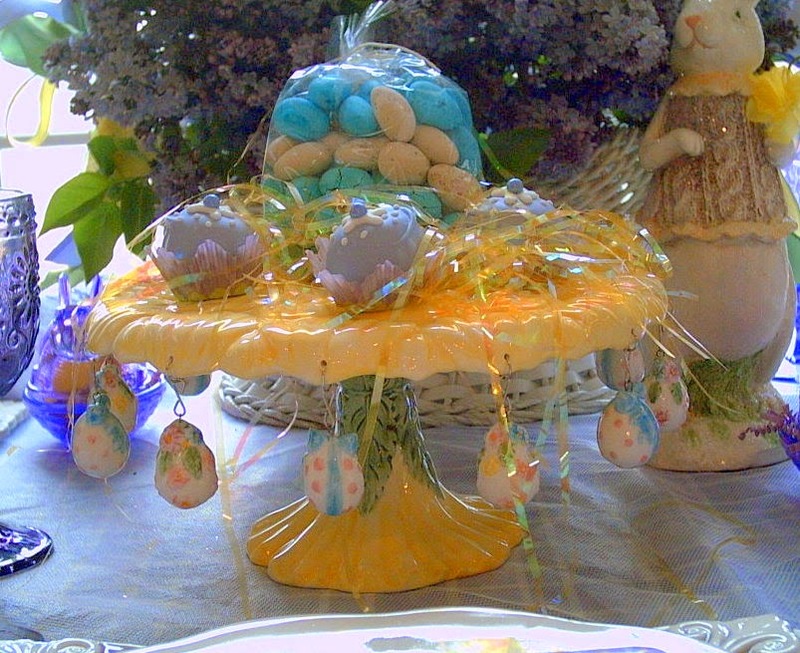 The other variety is a unique marshmallow double dipped in chocolate with the outer candy coating. This shop carries unique candy throughout the year, with specialties for holiday's. 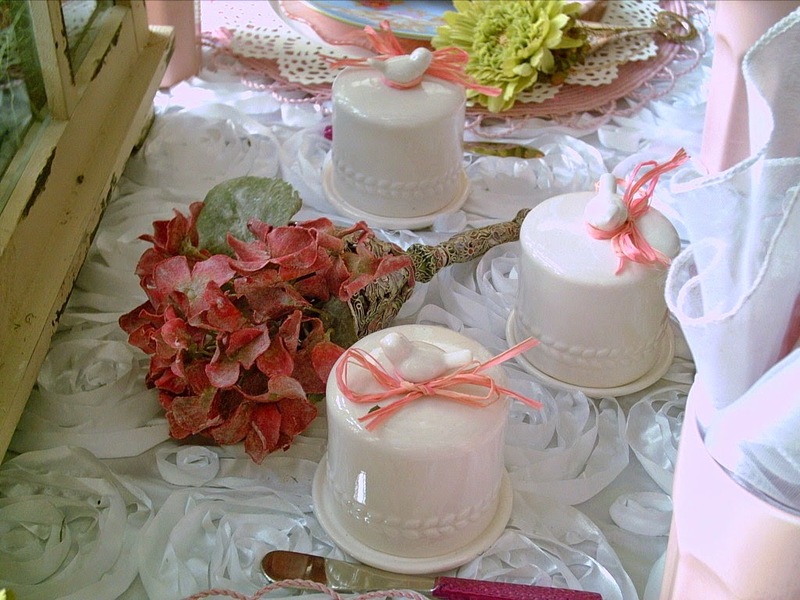 The cake pedestal came from Horchow a long time ago, but I think I saw it at a few other places. Please feel free to make a comment. I L-O-V-E Comments. Thank you. 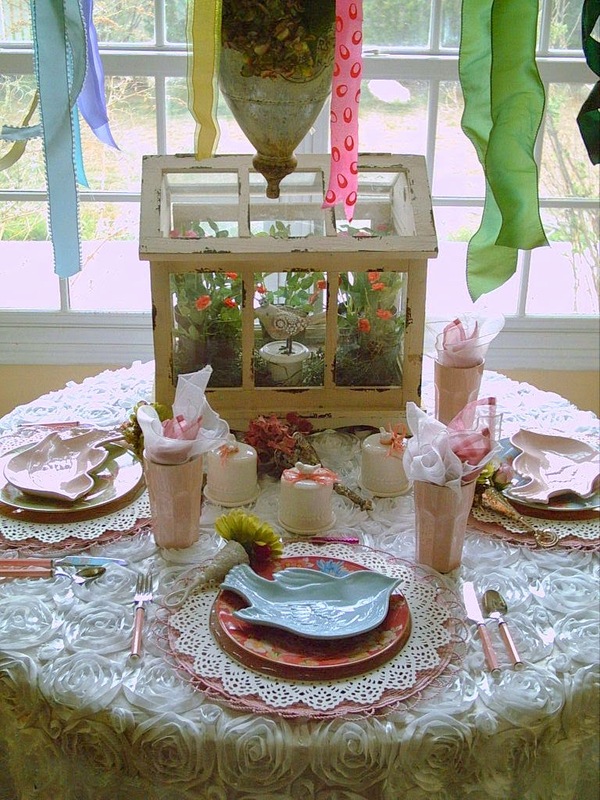 I will be sharing this tablescape with Between Naps on the Porch for Tablescape Thursday. I love the color green. Such a refreshing color. It is my 2nd favorite color. As in nature most all greens go together. So there is no worry matching green. The table is set for four of us. A quick little brunch. 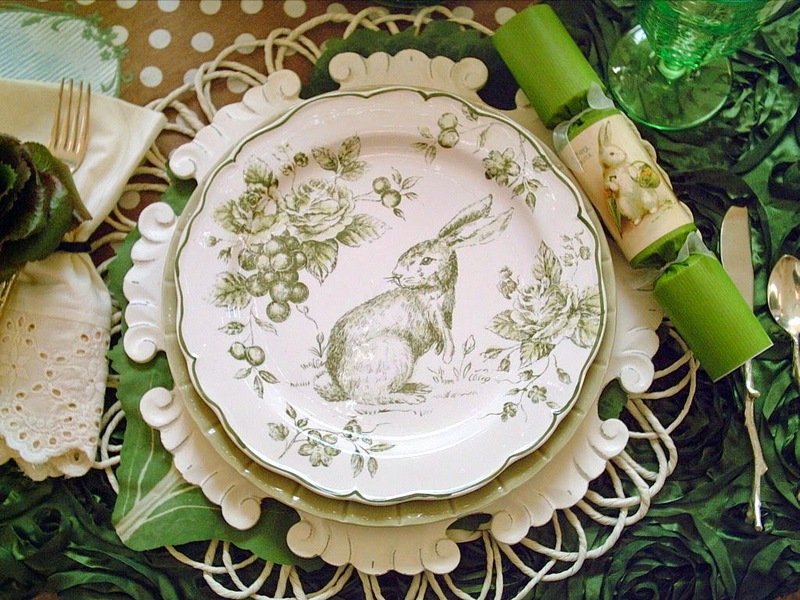 I just have to say I love the adorable bunny with green roses on the plates. 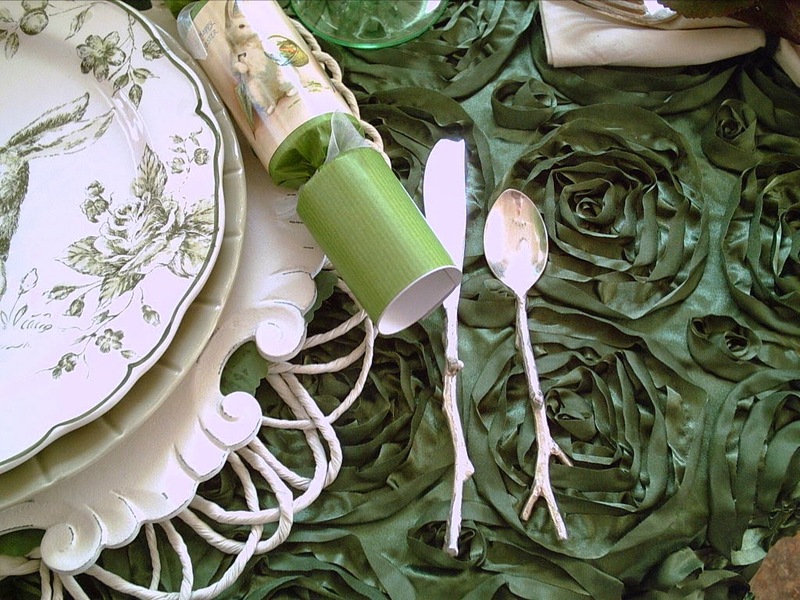 Because of the green roses on the plates, I used my green ribbon rose tablecloth. 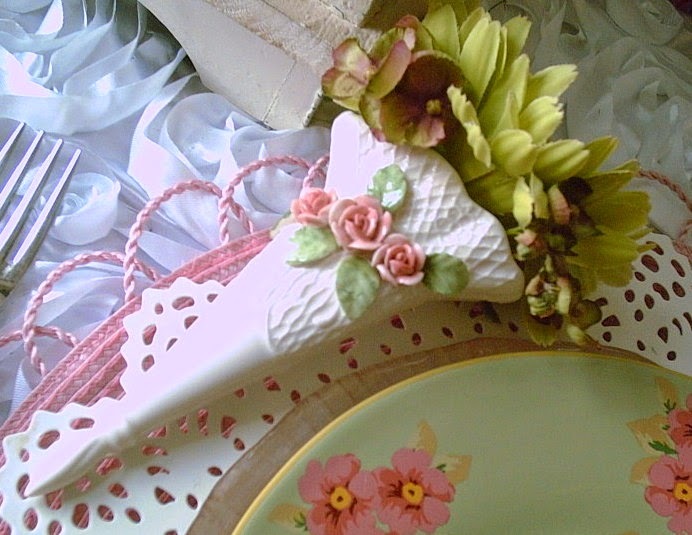 I decided I didn't want to use any of my ordinary napkin rings and decided to make my own. 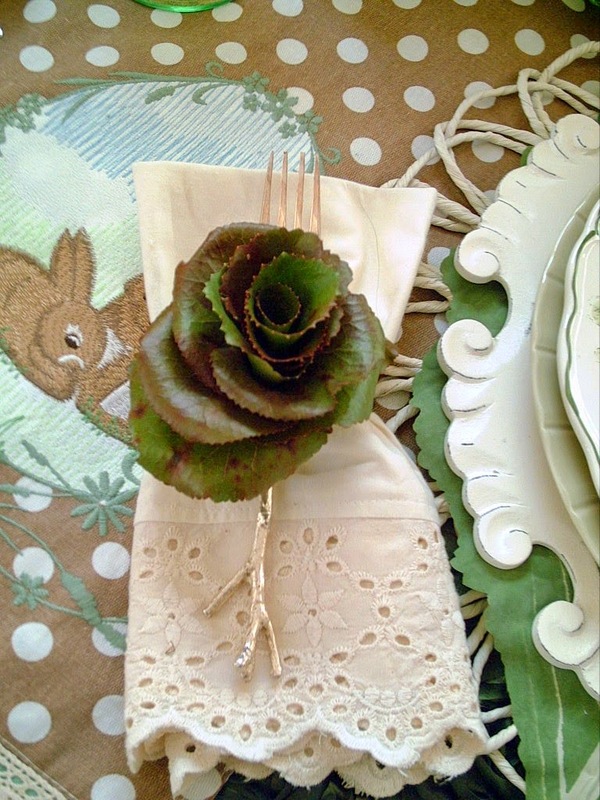 I made green roses from real Galax leaves. I learned to do this in a floral design course I took about 10 years ago. They are so organic looking. I was able to purchase them at a floral supply. You can find them at some florist shops as well. I will describe how I made them below. If you click on the picture it will enlarge for a better view. 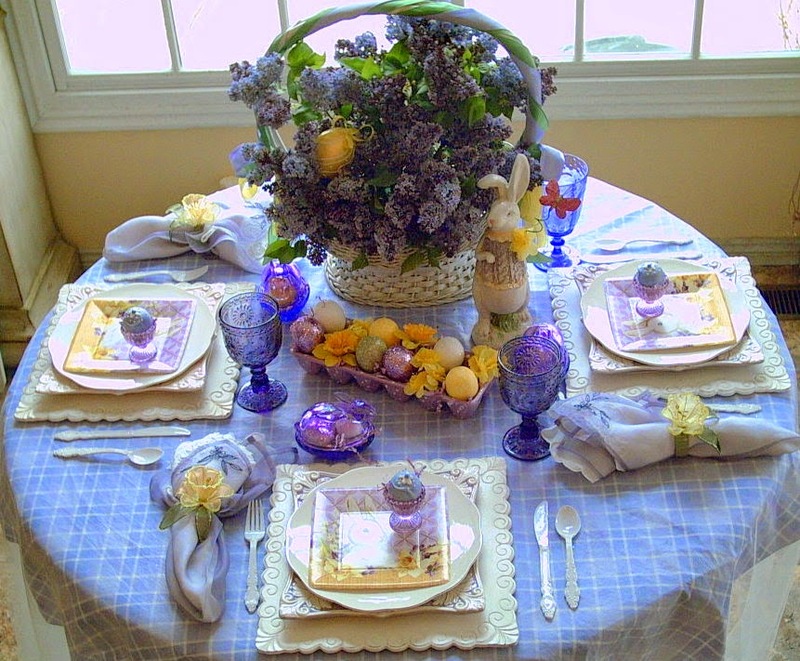 Close-up of the place setting and a full view of the complete tablescape. 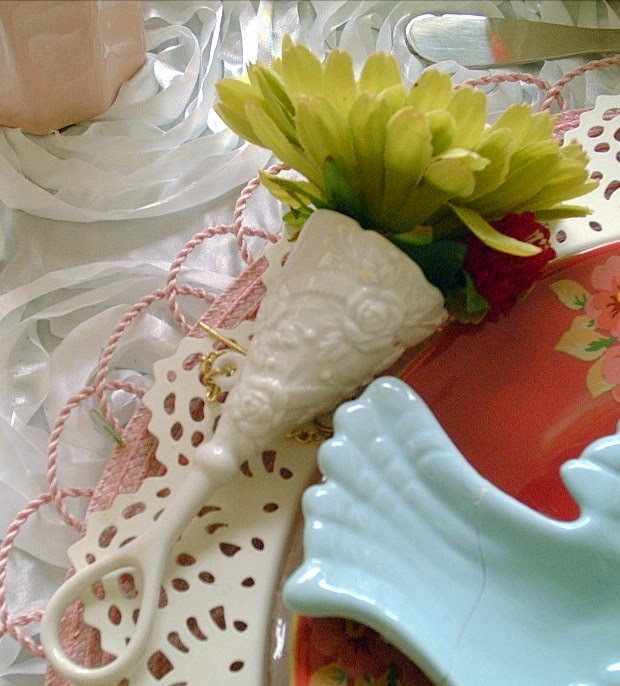 This whimsical table will be used for a late breakfast or brunch. I haven't quite decided. 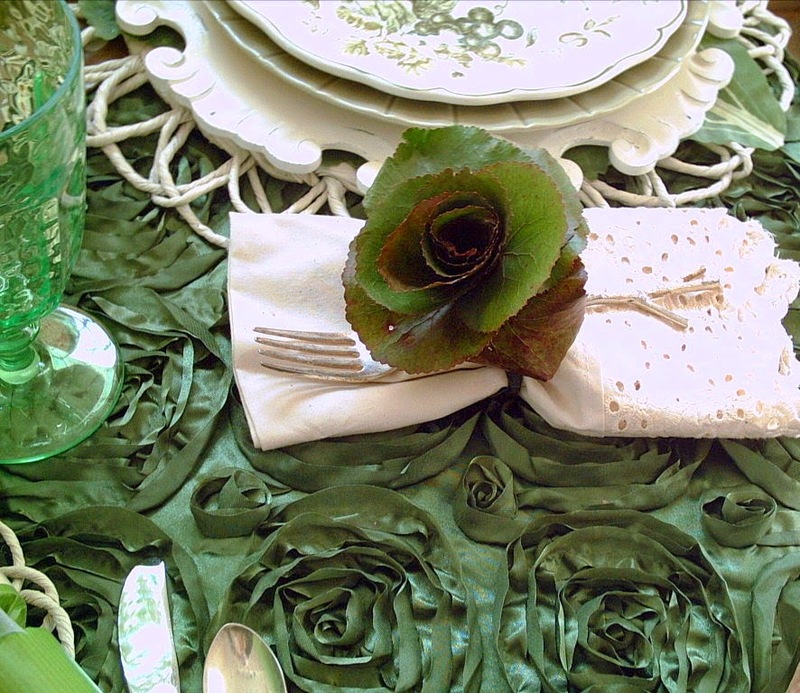 As you can see I am using a green ribbon rose tablecloth, (purchased online). 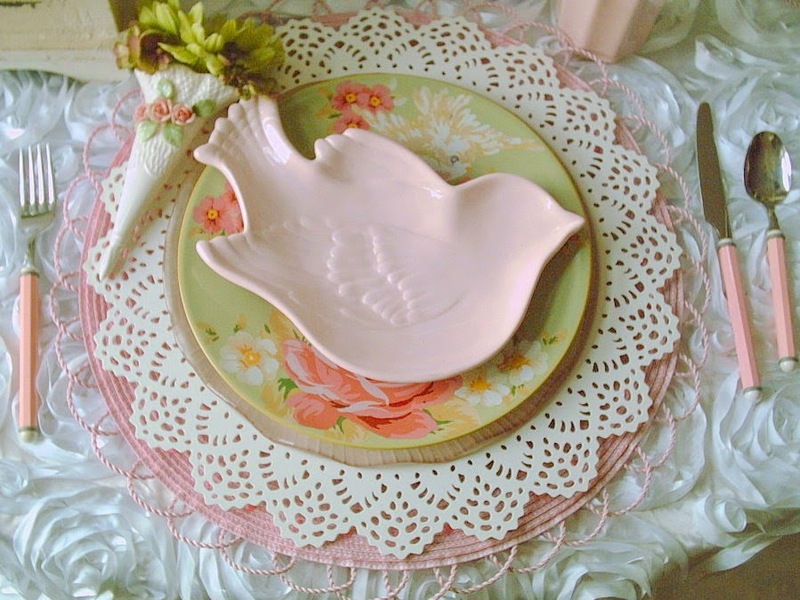 I fell in love with this so cute (to me) runner that I purchased at the pharmacy. At least I think it is adorable! I love the gift line at this pharmacy. You never know where you will find something unique and in unexpected places. 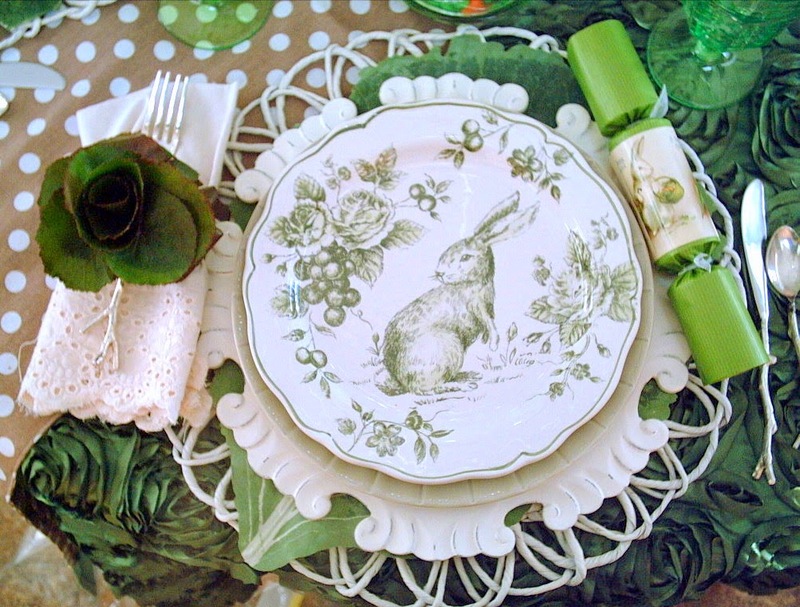 My centerpiece pitcher is the match to the Green Bunny Toile plates. I debated on whether I should use fresh flowers or not, but I have had these faux double green tulips for years and thought it would be my best choice. 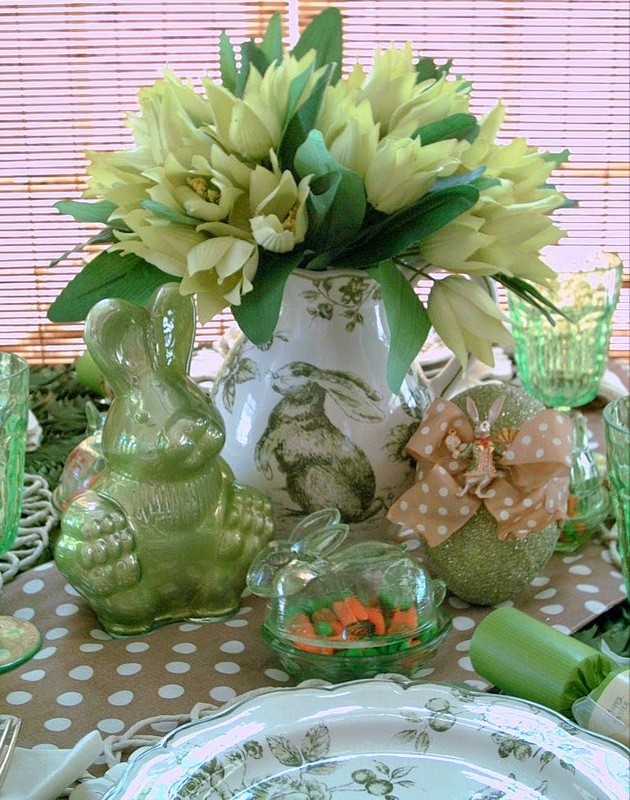 I have used a green mercury glass bunny and a fun Easter egg I made last year. The egg is paper mache' from IKEA. I covered it in green glass glitter that I had on hand. I love glass glitter (not glitter that should be used by children). 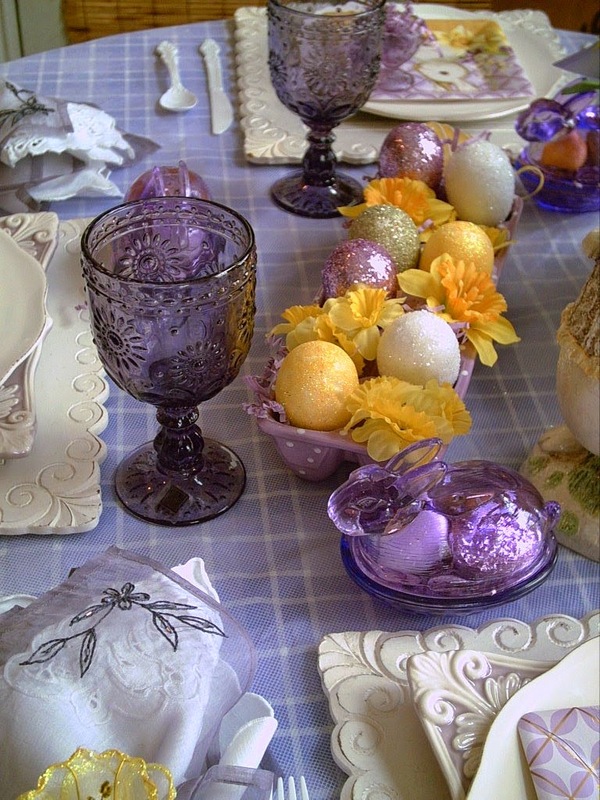 Glass glitter is made from either glass that is used in stained glass, or silvered glass. 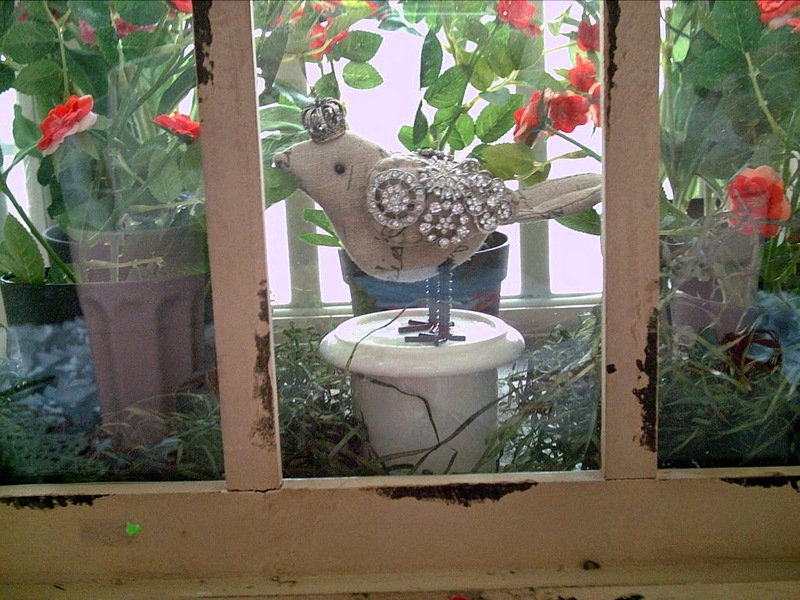 The silvered glass develops a beautiful patina over time and is certainly stunning. 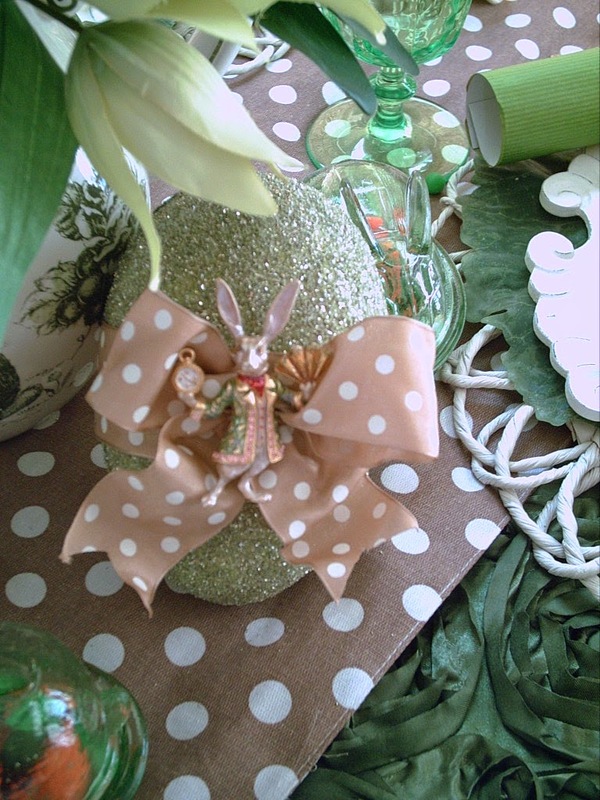 I had some tan and polka dot ribbon that I tied around the egg, which matches the runner so well and pinned on my rabbit pin. He even has a green jacket to match! I wanted something organic to add to the table in keeping with my theme. I made some roses from REAL Galax leaves. I know of a couple of ways to make them and it is just personal preference on which method you choose. I wanted a tighter rose, so what I did was with one leave I rolled it like you would a cigarette, rolling tighter at the bottom. I wrapped a wire around the bottom. I just continued to wrap around another leaf, gradually making them more loose or relaxed. Remembering to always leave the top more loose than the bottom wrap. I put wire around every 2 leaves. This gives you enough solid wire to wrap with florist tape and then curl around to form the ring. Galax leaves are sold in bunches about 20 leaves per bunch. You can get them at a wholesale floral supply or some florist shops, just call around to find one. 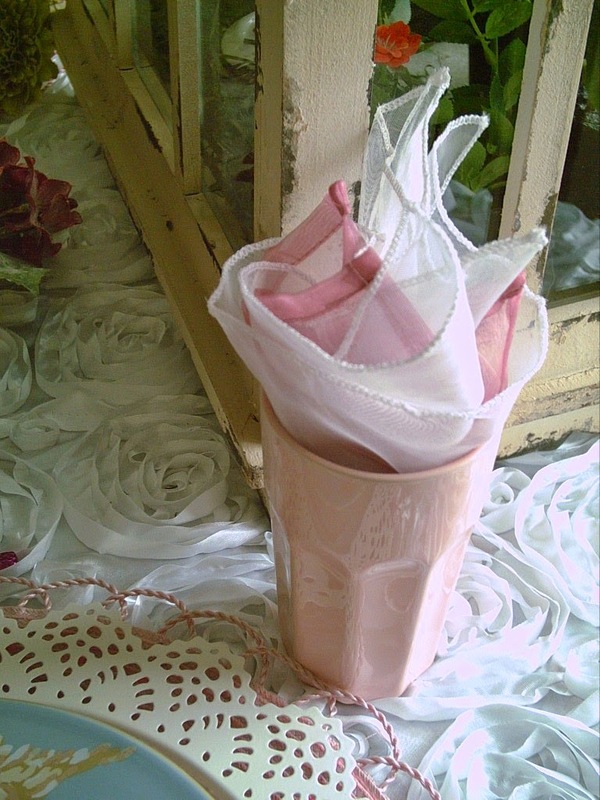 There are other methods to make these roses but this is the way I learned so that is what I do. 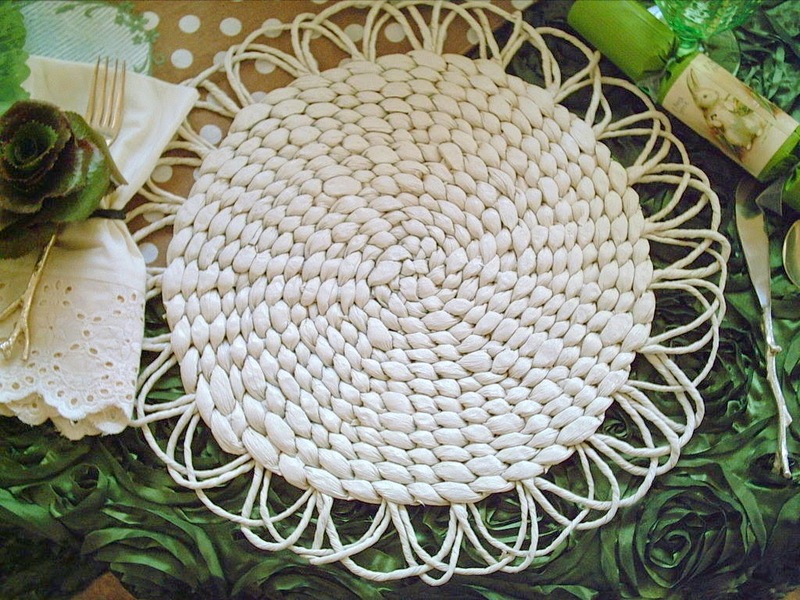 For weddings in my state lots of people that are Polynesian have these made, especially for the men to make a lei. The lei usually rides over one shoulder. I think that is so cool. If you follow my posts or check them out you will see I use a lot of cracker/poppers. I purchased these green ones last year. They are so fun with their pop noise and filled with a prize. The next several pictures show how I did my plate stack. Starting with this placemat. 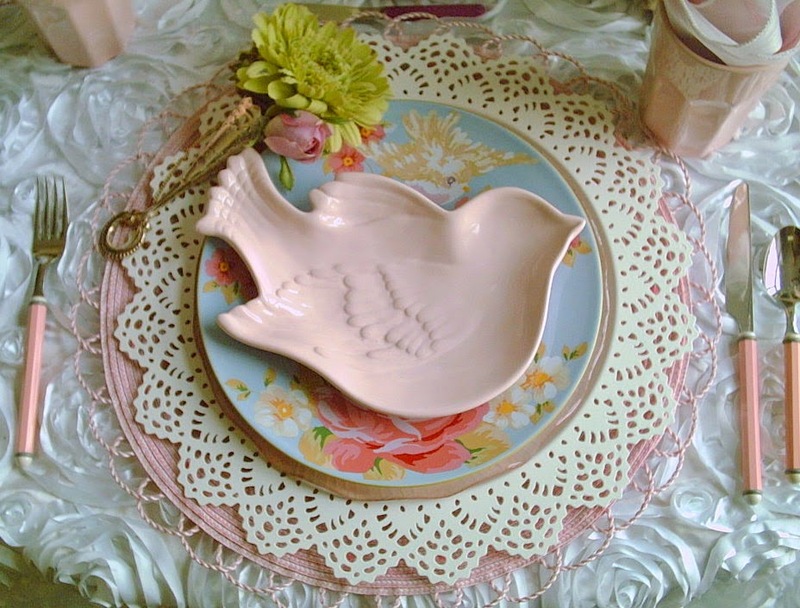 Purchased from Pier One. 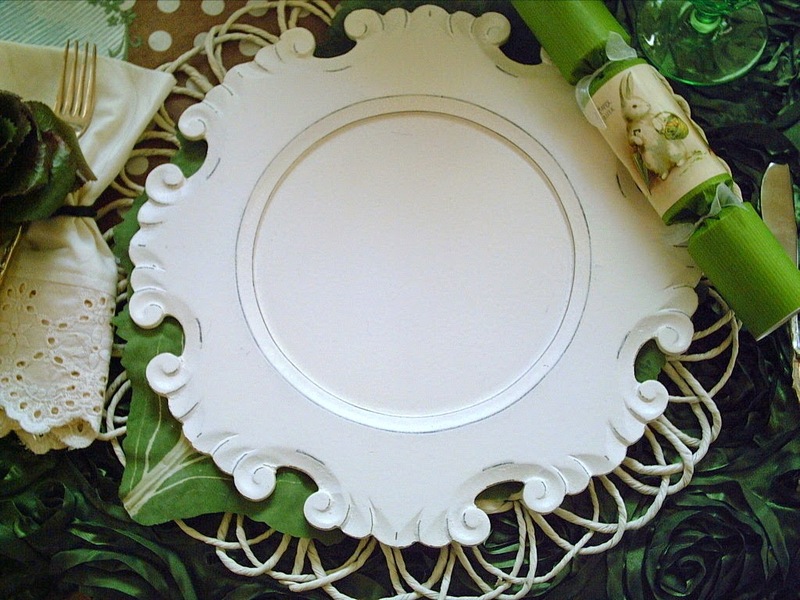 I wanted a creamy white color so I spray painted it on one side. When turned over the natural color can be used. 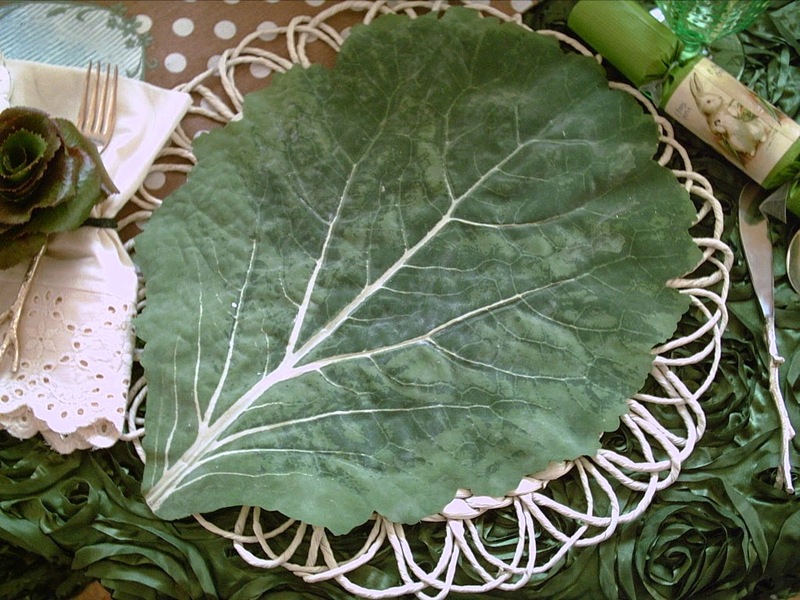 Next I used this large cabbage leaf, which I have had for years, I am sure you can still find them. 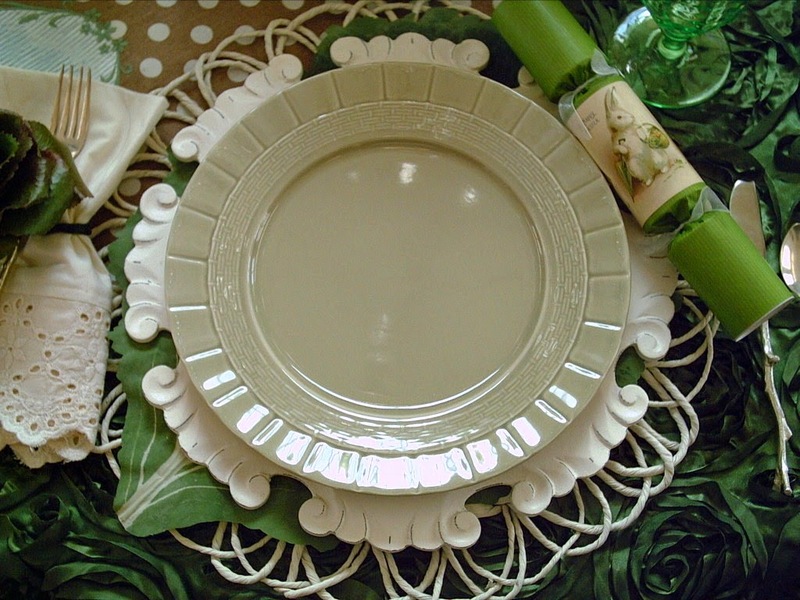 Next, I am using a green plate from the Martha Stewart line that was previously sold at Kmart. It is more green than my photo picked up. I really like these plates as the rim looks like pleated ruffled ribbon. 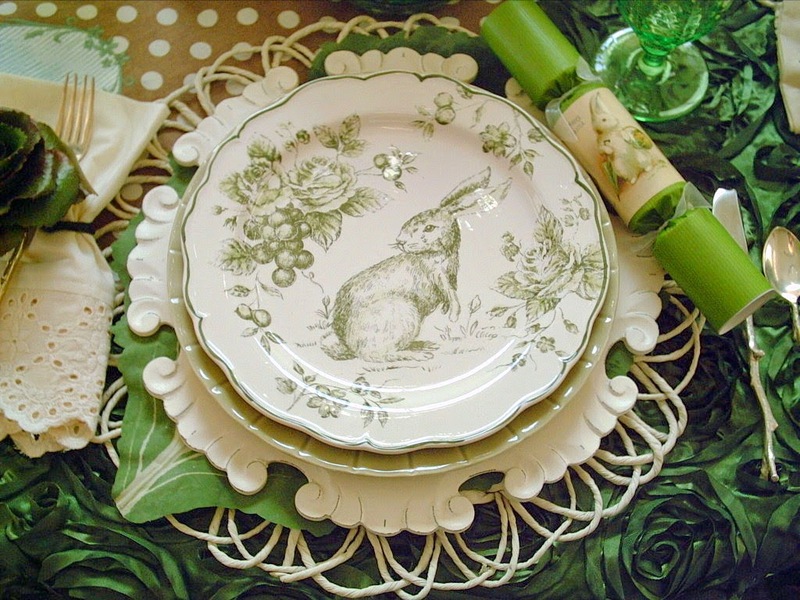 The top plates are the Green Toile Bunny plates. I have seen them a couple of places, but I got mine at Home Goods. 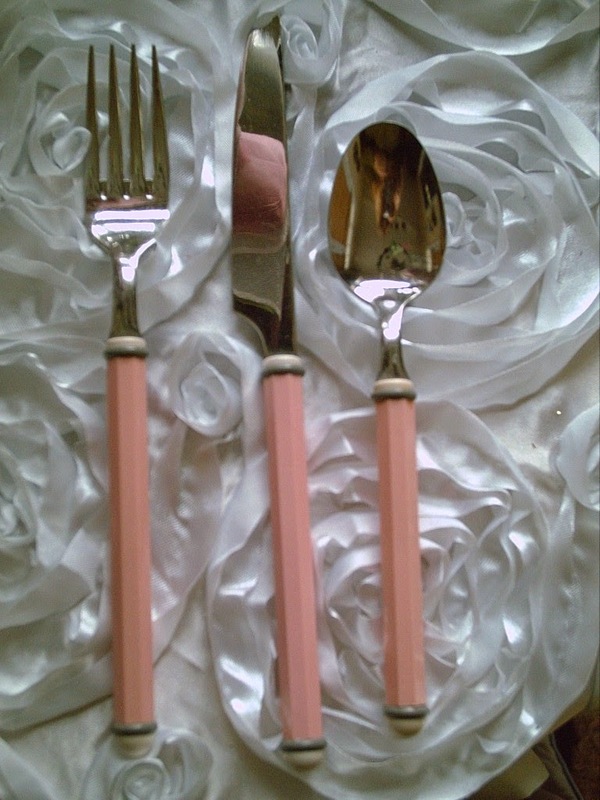 The silver plate Twig flatware is from West Elm and is no longer available. 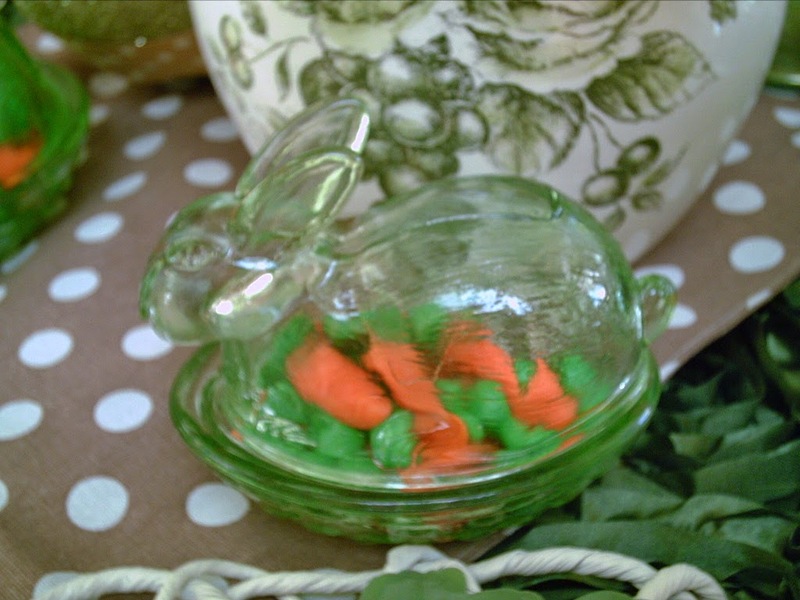 My little green glass bunnies. I put some candy inside. 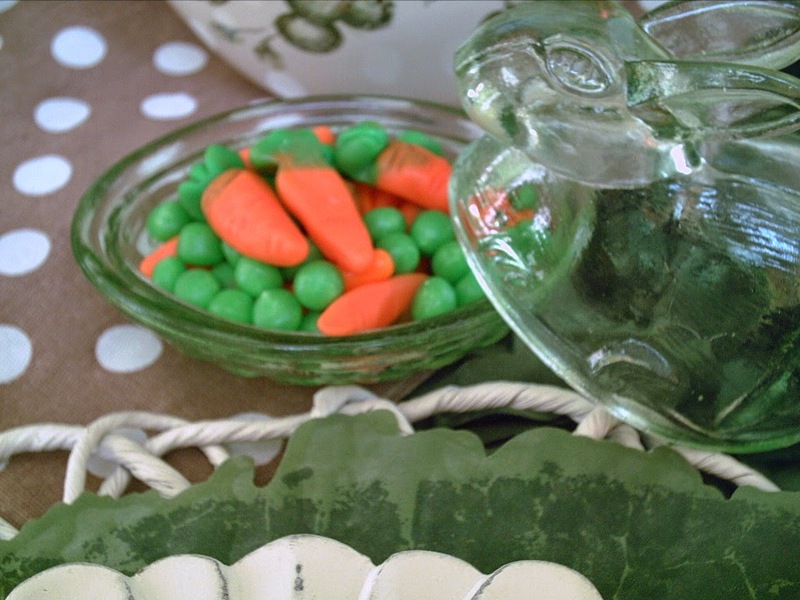 The candy is called "Peas & Carrots". Isn't it just the cutest candy? 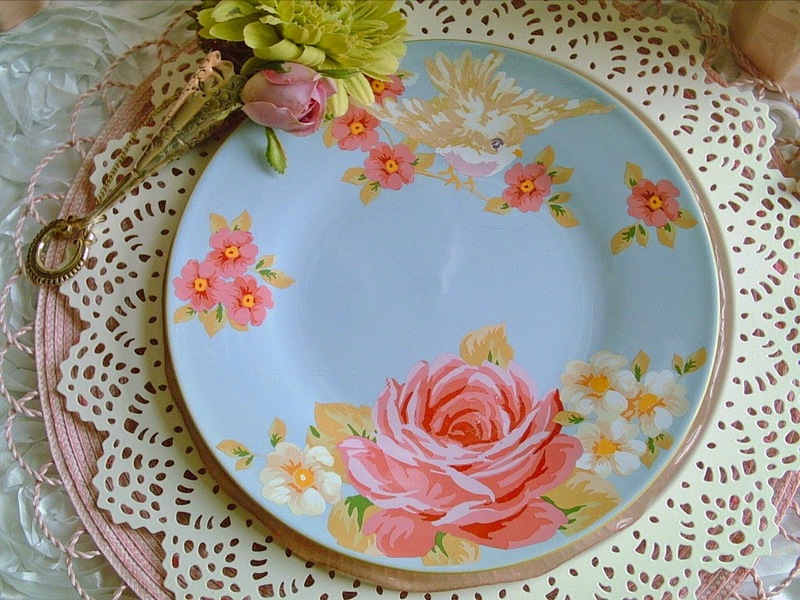 I will be posting this on at Between Naps on the Porch for Tablescape Thursday. 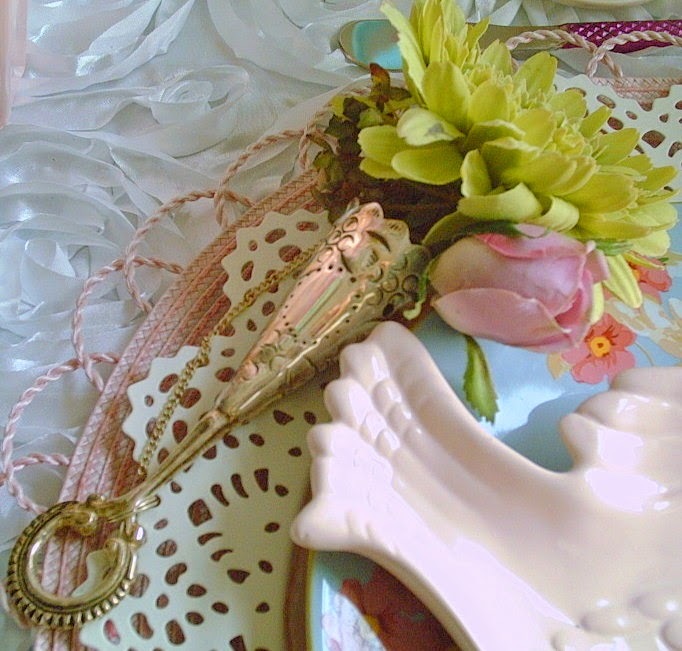 Sharing with Celebrate Your Story at Celebrate & Decorate. Please feel free to make a comment. They make my day! 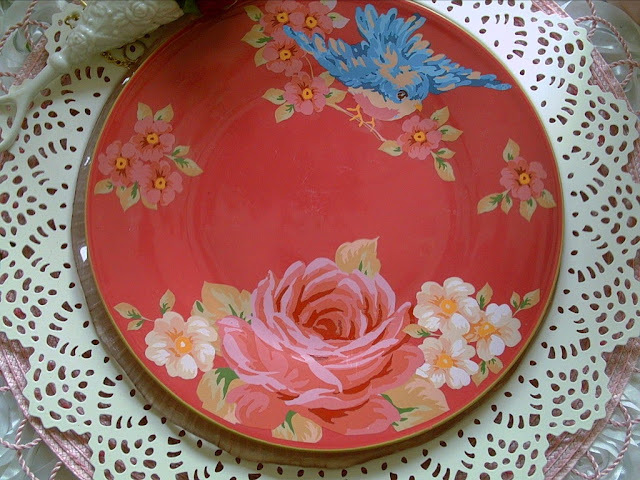 I will be sharing this on Tablescape Thursday at Between Naps on the Porch.